← The ARIZONA STATE MIXED DOUBLES PLAYOFFS will be held on March 8th & 9th at Venture Out RV Resort in Mesa. ISA President Myrna Bilton and FSA President Dave Kudro. During the opening ceremonies, both President Bilton and President Kudro shared events coming up. 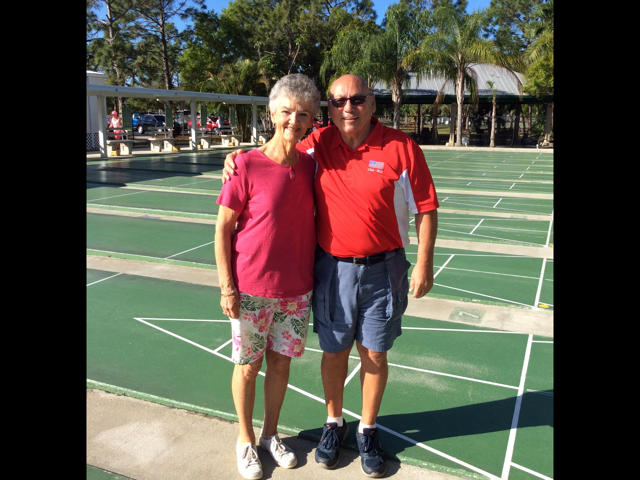 President Kudro shared the results of the previous State Tournament and reminded the shufflers of the upcoming board meeting March 17th, 2018 at Sebring FL at 9:00am. During the opening ceremonies it was evident as President Kudro and President Bilton showed a united front on promoting shuffleboard and a commitment to bring new amateurs to experience the joys of Shuffleboard. If every single shuffler, whether it be State wide, Nationally or Internationally, would take an active part to promote shuffleboard, be active in their club, bring in new shufflers and make them feel welcome and appreciated, it would pay big dividends for a bright future of Shuffleboard. This entry was posted in FSA (All Districts), ISA (INTERNAITONAL), USA NSA. Bookmark the permalink.